Enriching and engaging through creativity. Episcopal Homes’ Creative Ventures is a programming philosophy designed to engage and enrich lives through a range of creative outlets. 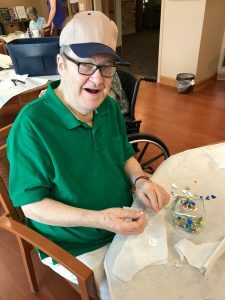 From professionally-led pottery and painting courses to educational series and theater outings, there is an opportunity for everyone to grow their creative side at Episcopal Homes. Engagement in creative arts is proven to positively impact wellbeing. Research by Geriatric Psychologist, Gene Cohen, showed that involvement in professionally-led creative education is good not only for mental health, but also for physical health; resulting in fewer doctor visits and less medication usage. Elderly who had engaged in the arts were found to have a 73 percent reduction in mild cognitive impairment according to a Mayo Clinic study. At Episcopal Homes, it’s never too late to explore a new hobby or creative interest! CLICK HERE TO VIEW SEE WHAT’S HAPPENING TODAY AT EPISCOPAL HOMES! 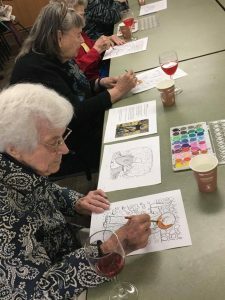 Wine and art class at Iris Park Commons, Assisted Living. 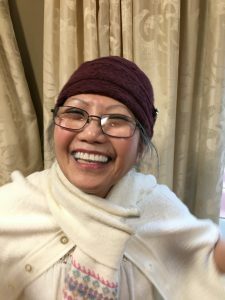 Linda, a resident at Kings Crossing, presented her published writing in a Life Stories presentation. Carty Heights resident, Jim Moore designing a decorative vase in Studio K, Episcopal Homes artist studio. 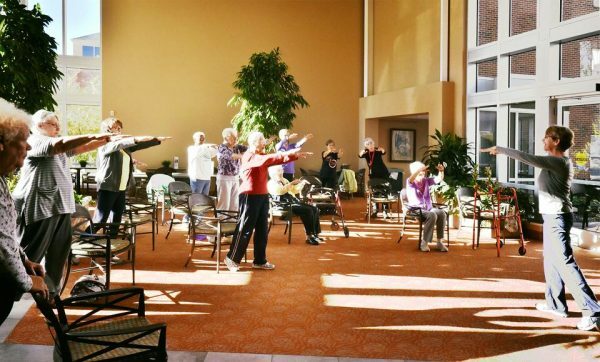 Episcopal Homes is a member of the International Council on Active Aging. The ICAA Integrated Wellness Model is the foundation of our wellness program. Enrichment programming is funded entirely by the generosity of donors to Episcopal Homes Foundation.